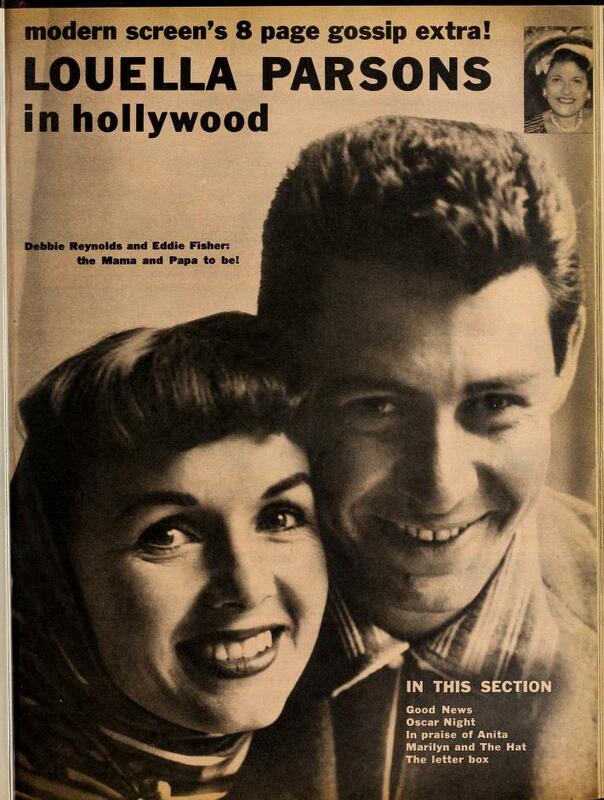 Today's star is the unsinkable Debbie Reynolds. TCM is celebrating the career of Debbie Reynolds with 13 movies on Aug. 23. Here's what you need to know about one of MGM's top musical stars of the 1950's. FYI: TCM sometimes changes the air times and /or movies, so you can go to www.tcm.com to check the updated schedule. Born: April 1, 1932, in El Paso, Texas. AKA: Mary Frances became Debbie when she got a Hollywood contract. Academy Awards: Reynolds was nominated for best actress for The Unsinkable Molly Brown (1964). 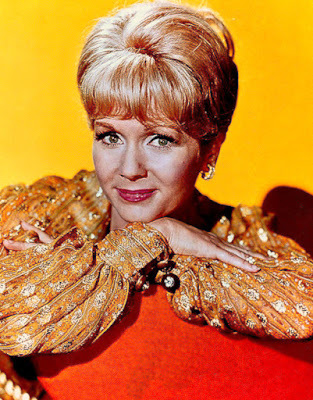 Brief bio: Reynolds family moved from Texas to Burbank, Calif, when she was 7. Although her family were strict Nazarenes, they encouraged Reynolds singing and dancing talents and she nabbed a contract with Warner Bros. at age 16 after talent scouts spotted her in the Miss Burbank beauty contest. Reynolds floundered at Warners, but she found her niche at MGM. Reynolds got her big break in Two Weeks with Love (1950) where she performed "Aba Daba Honeymoon" with Carleton Carpenter, and she became one of MGM's top box-office stars after she appeared in Singin' in the Rain (1952) opposite Gene Kelly and Donald O'Connor. Reynolds became a tabloid staple after her marriage to singer Eddie Fisher broke up, but she continued to star in popular movies like The Unsinkable Molly Brown. Reynolds movie career slowed down in the 1970's, but she never stopped performing, becoming a headliner in Las Vegas and receiving a Tony nomination for her role in the musical Irene. Reynolds is still singing, acting, and dancing today, and she recently published her autobiography, Unsinkable. 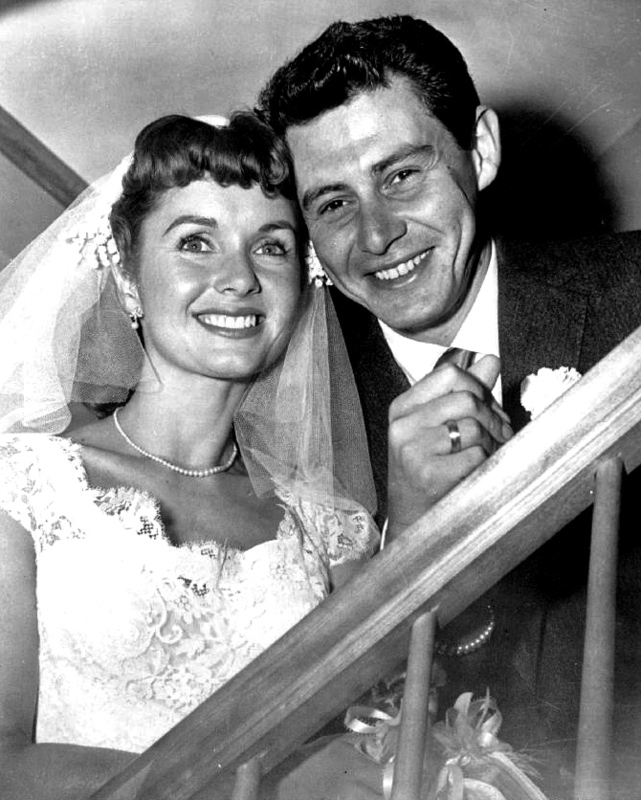 Debbie Reynolds and Eddie Fisher at their 1955 wedding. Fun Fact: Reynolds was a devoted Girl Scout and troop leader, and the scouts have a scholarship in her name. 1.Today also happens to be Gene Kelly's birthday, so watching the classic movie musical Singin' in the Rain, airing at 8 p.m., is a great way to honor both stars. 2. The Catered Affair (1956), airing at midnight, is a drama featuring Reynolds as the overwhelmed daughter of Bette Davis and Ernest Borgnine (yes, this movie asks you to imagine what would happen if Bette Davis and Ernest Borgnine had a child). This family drama concerns a daughter who wants a quiet wedding, but her pushy mother plans to blow all of the family's hard-earned money on a catered wedding with all the trimmings. 3. The Unsinkable Molly Brown, airing at 2 a.m., isn't the best Titanic movie out there (that would be A Night to Remember), but it's still great fun, with Reynolds perfectly cast as the brassy Brown, a real Titanic passenger who survived the fateful voyage. A great movie not featured during Summer Under the Stars: The Tammy series of musicals are great escapist entertainment. although Reynolds only starred in the first movie, Tammy and the Bachelor (Sandra Dee took over for the next two movies). Old Hollywood video: This Antiques Roadshow segment shows off Reynolds amazing movie memorabilia collection. Fan Magazine Flashback: Gossip columnist Louella Parsons gets the scoop on the newlywed Mr. and Mrs. Fisher in Modern Screen. Courtesy of the Media History Digital Library. Old Hollywood GIF: Kelly, Reynolds, and O'Connor singin' and dancin' in the rain. Courtesy of giphy.com. For more Summer Under the Stars articles, go here. There'll be plenty more on Reynolds on social media. Follow me on Tumblr, Google+ or Pinterest or like us on Facebook. Follow us on Twitter @oldhollywood21. I'm glad you like the articles. I decided to do them as an experiment, but I'm having a lot of fun. Thanks for the link to the Tammy article, I really love that movie, and thanks for the invite to the blogathon.